The Magnificent Merapoh Trail 2016 | JustRunLah! The Magnificent Merapoh Trail (TMMT) is founded as a Trail Running event to save Merapoh Caves. Our main objective is to preserve national heritage and save Merapoh Caves, which include at least 85 precious limestone hills and dozens of rare species of flora and fauna. These national heritage are under the threat of destruction from planned big-scale cement production project in Merapoh. The organiser of TMMT is working closely with the local people in Merapoh to promote sport and outdoor events in supporting local eco-tourism. The next five years will be dedicated to creating more events in Merapoh including trekking, trail running, MTB, caving and adventure trips. 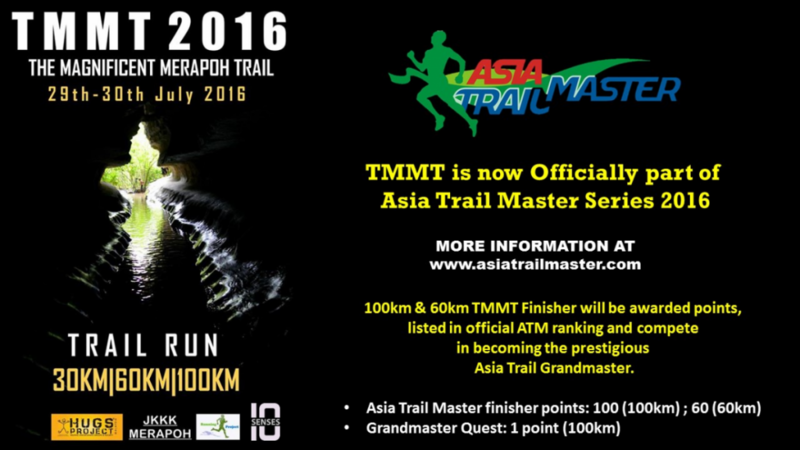 TMMT is a trail race with 30km, 60km and 100km categories. Participants will run through the beautiful trail of Merapoh, caves and wade through rivers. This race is a fast course with less technical sections and caters for beginner trail runners. Cut off time of 12 hours for 60km and 10 hours for 30km category. We will introduce a new category - 100km in 2016 with 20 hours Cut-Off Time. Come to Merapoh this July 2016 and fall in love with our beautiful trail.